The Indie Design Gift-A-Long (GAL) is a HUGE knit-a-long/crochet-a-long (KAL/CAL) with tons of discounted patterns (during the discount period) and many, many prizes to be given out during the six weeks of the GAL! 335 independent designers from all over are participating. You can see who they are here – with pictures indicative of their work. My post is here: #203. From November 22nd at 8:00 pm (EST) through November 30th at 11:59 pm (EST) each of 335 participating indie designers will offer 25% off a bundle of patterns with the coupon code giftalong2016. How will you know which patterns are eligible for the discount? Each designer’s post includes a link to his or her Indie GAL bundle of sale patterns. My sale bundle is here. 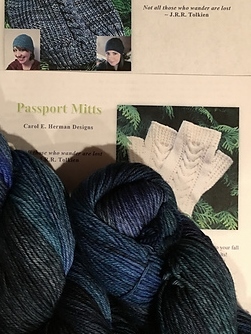 There are over 100 physical prizes (pictures here) – I’m donating patterns for The Wayfarer Hat and Passport Mitts along with two skeins of Mmmmalabrigo Arroyo to make them with. Check out all the fun and lovely prizes! Additionally, each of the designers is donating 6 electronic coupons for free patterns. 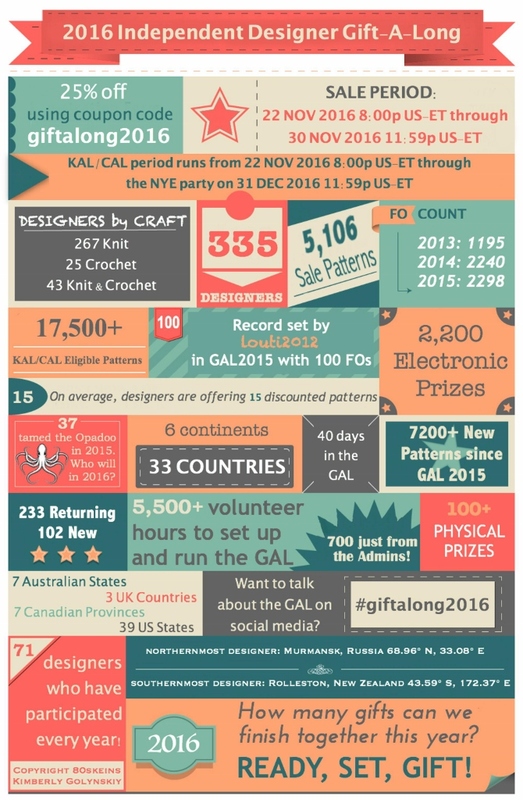 That means at least 2,000 patterns will be given away over the six weeks of the GAL! The GAL is divided into eight KALs/CALs, divided by type of project: head, hand, feet, kids, garments, shawls, neck, other. 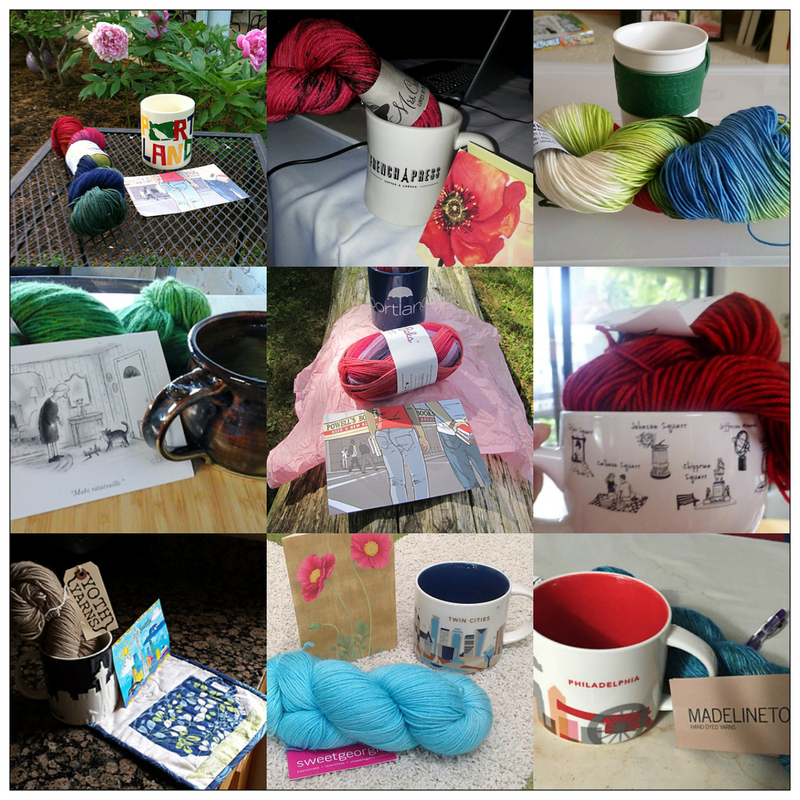 When the GAL begins, there will be a thread for each KAL/CAL, and in that KAL/CAL, prizes will be given out, games will occur, and there will be lots of fun, chatter, and admiration of knitting (and crocheting). The KAL/CALs will begin November 22nd at 8:00 pm (EST) through December 31, 2016 at 11:59 pm (EST). Which patterns are eligible for prizes? You can make any paid pattern by any participating designer to be eligible for prizes. While no more than 20 patterns will be in the discount bundle of any designer, all of the designer’s paid patterns are eligible for prizes. Some amazing indie design volunteers are putting together Pinterest boards that will allow you to browse through the GAL-eligible designs by type, and they are also putting together some bundles that will allow you to use Ravelry’s advanced search to look through the sale patterns and all of the eligible patterns. These boards and bundles will be coming soon. 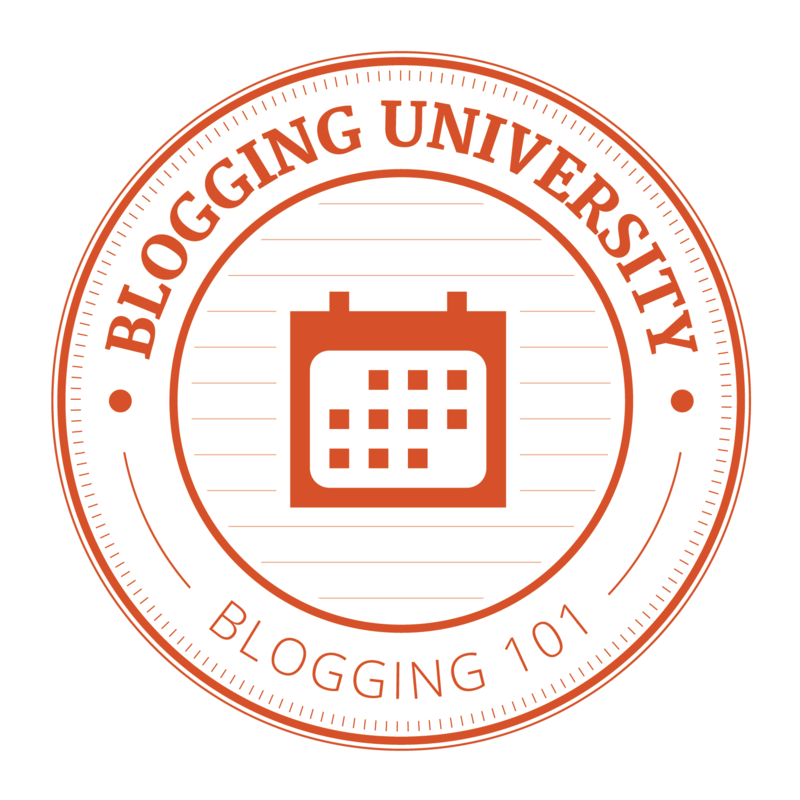 I hope you’ll consider joining me for this fun and inspiring six-week GAL. This would be a great time to whip out some spa cloths or fingerless mitts for gifts (or for yourself)! Like the Ravellenic Games, the camaraderie is a powerful motivator to finish projects. The possibility of prizes doesn’t hurt either! Feel free to ask me here or in my Ravelry group, or ask over in the GAL group. Check out this awesome infographic made by Kimberly of Around the World in 80 Skeins . Isn’t it amazing? If we don’t touch base again between now and then, have a very happy Thanksgiving.